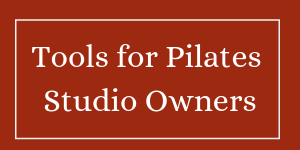 You are here: Home / marketing pilates / Want an easy way to get more Instagram Followers? Want an easy way to get more Instagram Followers? Sometimes we just make things complicated. 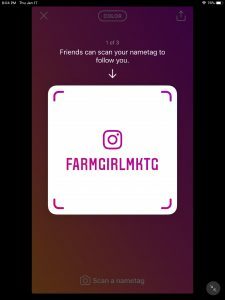 There’s a zillion ways to get more Instagram followers (paid and organic) but last week when I went to a hair salon, I found a great easy way to get more followers. When I was checking out, they asked me if I followed them on Instagram. I said no. They had their IG name tag taped on the back of the checkout computer (facing me) — so the receptionist said — if you follow us, we’ll give you a free gift. All I had to do was get out my phone, open Instagram, went to the scan nametag option and focused my camera on their IG Name Tag, and the phone did the rest. I was following them on IG – and the receptionist handed me a sample of hand lotion. It was pretty easy and fun! I’m not sure the giveaway is necessary – I think plenty of people would try the easy way to follow your social media! However, it’d be pretty easy to scan, and put names into a drawing for a prize! Then you could give them an extra “entry” into the drawing if they reposted one of your posts, or tagged them in a post. If you get your clients to share your content, that will help your content get to more people! Follow our blog to get more social media tips for marketing your business! Previous Post: « 9 new students in 7 days with a Facebook Event and 2 Ads!